Note that this quest is one half of a branching decision between siding with the Mages or siding with the Templars, in this case siding with the Mages. If you wish to side with the Templars, do not pursue In Hushed Whispers in its entirety. Completing one quest will preclude your involvement in the other. That said, you can go to Redcliffe Village during the first half of this quest without negating the opportunity to meet with the Templars instead. More on this below. - To begin this quest you must first make your way to Redcliffe Village, found in the northeast of the Hinterlands. You can reach Recliffe by walking northeast from the Crossroads and up the cliffs on your left. If you see a fortified wall ahead - and a Fade Rift just beyond it - you'll have found Redcliffe Road. Head north from here to find Redcliffe itself. - Upon arrival at the front gate you'll find a Fade Rift, guarded by a number of Wraiths. They're difficult to maneuver, but clustering them together makes for a pretty easy fight. Close the Rift once they're gone, then pop into the town for a cut scene. - Redcliffe is a fairly large place. Start by heading up the hill on your left, towards a ruined building. You can claim the Redcliffe Windmill Landmark when you reach the building. Return to the entrance from here and descend into Redcliffe. - Once you're within the village proper you'll find a house on your left. It's currently locked, and you need a particular Inquisition Perk (Deft Hands, Fine Tools) which you probably won't have yet to get it open. Down the street from here and on your right, at the base of a monument, you'll find the Fast Travel stone for Redcliffe. Don't neglect to activate this thing. Beside it is a Storyteller who will give you the A Spirit in the Lake quest. - Continue north from the Fast Travel stone to find the docks, such as they are. Look on your right for a dude who will give you the Flowers for Senna quest. A Dwarven Bookseller down here sells a variety of Weapon and Armor Schematics, and if you walk all the way to the ends of the docks you'll find assorted boxes and other containers with loot for your stash. Check the boats for the Dwarven Merchants Guild Codex entry. Also down here is a locked house a Rogue can open; inside you'll find a book with an update for the Oculara Codex entry. - If you head east from the Fast Travel stone you'll find more or less the centre of Redcliffe, signified by the Hero of Ferelden Landmark. (Woo Hero of Ferelden Codex entry.) On your right is another locked house, but if you continue past this home you'll find another off the beaten path. Inside is a woman who will give you the A Common Treatment quest, which leads to several other quests besides. 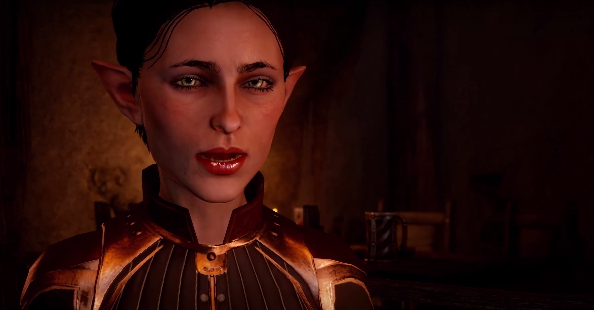 If you have Cassandra in the party you can have her convince the woman to help out at Crossroads, which will additionally give you - and complete - the Healing Hands quest. - To the left of the previous Landmark you'll find a weapons shop, and inside it the Ferelden Culture Codex entry via a book in a side nook. On the right is an armour shop. Keep following the path and head up the stairs on your right to find The Gull and Lantern, where you'll continue the main quest. (Though make sure you go up the last set of stairs here to find another small house, wherein you'll discover some boxed loot and the Hero in Every Port (Ballad of Nuggins) Codex entry. 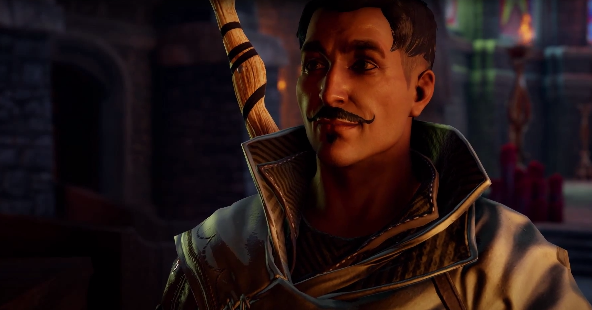 Dorian, a Mage of Tevinter. Not a Magister. Get it right. - Pop into The Gull and Tavern to trigger a cut scene. Tevinter fun ensues. Once the cut scene is done you'll be given a message sending you to the local Chantry, and you can have a look around The Gull and Lantern; speak to the Tranquill named Clemence and, as the conversation closes, he'll offer to become an Agent for the Inquisition. You can also find the Crows and Queen Madrigal Codex entry in here, sitting atop a barrel. Upstairs you'll find the Annulment of Dairsmuid and the Seers and the Allsmet Codex entries, one in the hallway in the other in the larger room on the left. - Head back into Redcliffe and wander north from the Tavern. As you head towards the cliffs at the edge of Redcliffe you'll see the Redcliffe Village Chantry on your right. Pop inside and you'll find a dude named Dorian fighting off demons from a Fade Rift. Take out the demons - easy fight - and close the Rift to trigger another cut scene. After the plot dump is done you gain one Power and be directed back to the War Room in Haven. Have a look around the Chantry - you'll find a chest up on the altar, and a book with the Troubles of a Chantry Scholar Codex entry along one side of the building - then return to Haven. The big moment. When you return to Haven and check out the War Room you'll find two Operations waiting for you, both of which cost 15 Power. If you go with In Hushed Whispers you'll continue the path of seeking support from the Mages, while choosing Champions of the Just will set you on the Templar's side. (Eventually.) Choose one and the other will disappear. The game will carry on either way, though how you proceed will affect later events. We'll explore both possibilities.